For over two decades, June Yamagishi and John “Papa” Gros have been bringing New Orleans and Japan closer together through music. Funk on Da Table, their latest band, will bring hard-hitting grooves back to Japan in February. The international group, comprised of Japanese and American musicians, will celebrate its one-year anniversary with dates in Tokyo, Osaka, Kyoto and Nagoya. The group is billed as a collaboration between Yamagishi, a Mie Prefecture native now based in New Orleans, and bassist Kensuke “Kenken” Kaneko of Japanese nu-metal groups Rize and Dragon Ash. 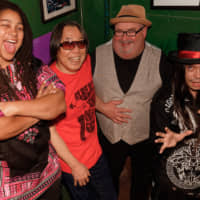 However, the driving force behind the group’s direction is the relationship between Yamagishi and keyboard player and singer John “Papa” Gros. The two were co-founding members of New Orleans group Papa Grows Funk, which was active for 13 years. Nikki Glaspie, formerly a drummer for Beyonce, completes Funk on Da Table. Although the guitarist left Japan in 1995 to start anew in New Orleans, he continues to hold onto his established working relationships. He usually performs in Japan a couple of times each year, typically joining long-time collaborators like Kaneko’s mother Mari.. It was during one such trip in 2017 that Kaneko approached Yamagishi about wanting to play New Orleans funk with him and Glaspie. He agreed with the 33-year-old’s concept for a multigenerational international funk group. “I wanted him to play New Orleans funk,” Yamagishi says in reference to the bassist. “He’s never played that kind of stuff.” Given that the guitarist’s American career is grounded in the style and Glaspie had previously worked with like-minded group Dumpstaphunk, the focus was an obvious choice. But the group was still missing something: John Gros. During Papa Grows Funk’s 13-year run, Yamagishi and Gros toured Japan multiple times. “We hadn’t played together in a long time,” Yamagishi says in reference to the group’s 2013 dissolution. “I got this call (from Yamagishi),” Gros recalls. “‘Hey. You want to come to Japan with Nikki and me and this guy named Kenken?’ ‘Yeah. I do.’ That was it.” After just two rehearsals, the group was performing live. 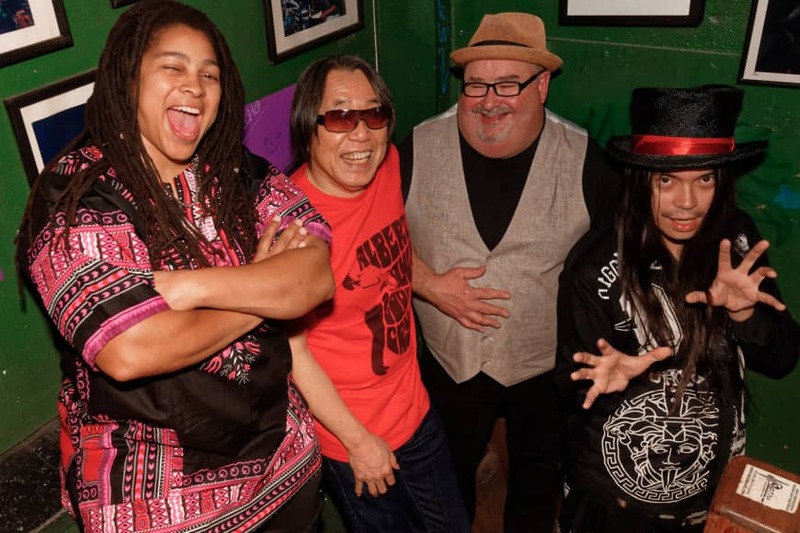 Together, Gros and Yamagishi put together a setlist for the band, largely drawing from Papa Grows Funk and the Meters, one of New Orleans’ most legendary groups. However, their tour did come at a price for the native New Orleanian. For the first time in his life, Gros missed Mardi Gras, an annual highlight full of festivities, parades and crazed costumes. “It was strange because I’m following it on Facebook. … (Seeing) pictures from everybody of the streets and the clubs,” he laments. To compensate, the band turned the night into a makeshift celebration of its own, adding Mardi Gras classics “Big Chief” and “Hey Pocky A-Way” to its set. Back home, Gros calls Yamagishi “the Japanese godfather of New Orleans.” According to him, the guitarist has been a major force in supporting Japanese musicians in the city, whether it’s helping them understand New Orleans culture or providing them a temporary place to stay. Following a little guidance, the new arrivals often work their way into the city’s most high-profile gigs. “I introduce everybody. After that, take care of yourself!,” Yamagishi quips. Following the Great East Japan Earthquake of March 2011, Yamagishi and Gros were able to use these relationships to benefit the guitarist’s home country. For Gros, that story starts in 2009, when Papa Grows Funk performed at La Strada, a tiny live-music venue in Ishinomaki, Miyagi Prefecture. Almost a decade later, the keyboard player still vividly recalls it. Despite it being a full house, everyone stayed in their seats, an unusual occurrence for the band. “All of a sudden, on the second or third song, this guy just stands up,” Gros recalls, explaining that the man then pushed his chair against the wall and started dancing in the middle of the room. “One by one, everybody did the exact same thing until there were no chairs left in the room … everybody was just dancing and rocking and rolling for the rest of the show. Less than two years later, Gros and his bandmates were shocked by the devastation. In 2009, the band had taken a group photo on a bridge in Ishinomaki. They immediately joined with organizers in New Orleans to schedule a benefit event, contacting many of the same Japanese musicians Yamagishi helped introduce to the city. Less than a month after the disaster, Papa Grows Funk performed a benefit alongside some of New Orleans’ top bands. According to Gros, the crowd of over 900 people raised more than $52,000 to replace boats that fishermen lost in the disaster. “I knew it was so much like all the coast of Louisiana towns and coast of Mississippi,” he explains. “A boat, fishing and livelihood: that’s all you really have besides your family. “That’s one of the best things I’ve ever done in my music world,” he adds, smiling. The group performed at Tipitina’s, a beloved venue that Gros refers to as their “shrine.” The group decided to record the performance for a potential live album and one woman even traveled all the way from Japan just to see Kaneko’s new group. She wasn’t the only one watching him. George Porter Jr. of the Meters was in attendance, watching the bassist perform tunes he laid down four decades ago. True to his roots, Yamagishi will visit his hometown after he finishes touring with Funk on Da Table. In the nearby city of Matsusaka, he’ll reunite with West Road Blues Band singer and fellow Mie native Takashi “Hotoke” Nagai to perform a blues set. Funk on Da Table performs as part of the Tokyo Funk Summit at Club Quattro in Shibuya Ward, Tokyo, on Feb. 3 (¥5,400). The band will play Umeda Club Quattro in Osaka on Feb. 4, Takutaku in Kyoto on Feb. 5, ReNY limited in Nagoya on Feb. 6, and Ebisu Liquidroom in Shibuya Ward, Tokyo, on Feb. 7 (each ¥6,800). For more information, visit www.funkondatable.com.